With the family finances in a parlous state, Flavia's father has rented Buckshaw to a film company for a location shooting. When a heavy snowfall cuts the village off, the actors are talked into staging a benefit performance in the parish hall. But old jealousies surface, and the leading lady is murdered. Flavia, who has been enlisted to help out behind the scenes, finds herself up to her knees in snow - and murder! If you could sum up I Am Half-Sick of Shadows in three words, what would they be? Flavia is a unique sleuth. She has a mind like a steel trap and the instincts of a bloodhound, she's 11. 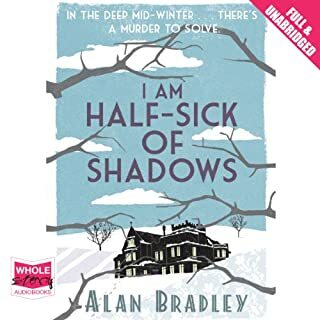 She has certain misconceptions, the pitfalls of being a child being lied to by adults in the way people lie to protect children ( and a couple of older sisters who lie just for the hell of it ).This leads to humour but Flavia's precocious intelligence,analytical mind and steely determination lead her on the trail of a murderer. Surrounded by a cast of characters varying from her unique, disjunctive aristocratic family and faithful retainers to a motley selection of villagers,actors,film crew and policemen Flavia tracks down the guilty. Funny and original. What does Sophie Aldred bring to the story that you wouldn’t experience if you had only read the book? Please keep them coming Mr Bradley. Please keep Sophie Aldred doing the narration. 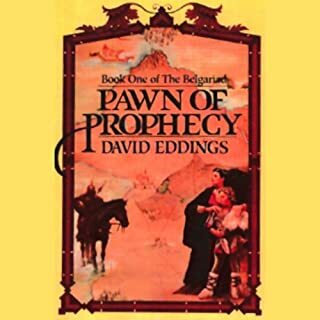 Would you try another book written by David Eddings or narrated by Cameron Beierle? I have read and loved the all the books of the Begariad but I could not listen to this narration. It is awful, overdone - Belgarion is a boy , his story deserves a young voice. The overly dramatic narration just jarred. Please find a softer voice for this series of books. Belgarion. Very easy to identify with. Just the wrong voice, overdone, wrong tone. Too in your face ( or should I say ear). Love the book , love Belgarion but ghastly narration really grates on the ear. Any chance of a new narration? The villagers of Bishop’s Lacey are holding their collective breath as St Tancred’s tomb in the local church is about to be opened after five hundred years. 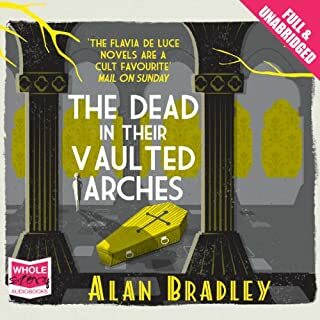 Inveterate eleven-year-old sleuth Flavia de Luce is first at the scene, but the body she finds lying there is not that of a desiccated saint; it is Mr Collicutt, St Tancred's celebrated organist. 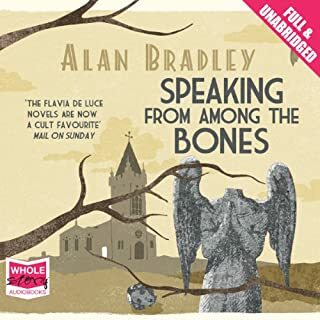 Would you consider the audio edition of Speaking From Among the Bones to be better than the print version? I love this whole series of books. The main character (and narrator) is a wonderfully enjoyable creation.This audio edition does Flavia justice! Flavia is 10 years old and both vulnerable and tough as old boots. Hugely intelligent and mentally tough,sometimes frighteningly ruthless in her methods, yet touchingly innocent in some ways. Funny,intrepid,insightful but sometimes outrageous especially when investigating murder.She is unstoppable. Love the setting , the crumbling stately home, the villagers, the period (early 1950s), the family and the laugh out loud inner thoughts of Flavia.. All these books are very funny because of the relationships between the characters and their various idiosyncrasies. The relationship of Flavia and her sisters is both difficult and close. Which character – as performed by Sophie Aldred – was your favourite? Flavia - wonderful character,perfectly portrayed by Sophie Aldred. Love all the characters , the De Luce family , Dogger and The Mullets, the long-suffering Inspector Hewitt and his men. The relationship of the three sisters. Flavia's reliance on and love for ( though she would never call it that) the troubled Dogger. There are passages in these books when Flavia's razor sharp brain and ruthless quest for a murderer are suspended and you see the vulnerable child beneath the intelligence. Please can we have the about to be published 'Thrice The Brinded Cat Hath Mew'd' in audiobook form ASAP - preferably read by Sophie Aldred? I love these books. Flavia is a unique amateur detective. She is frighteningly intelligent, unstoppable, funny and yet vulnerable. Why can't I find all the books in the series on audible? Even some I have don't seem available now. There is a new one due out in September 2016. Why can't I find it to pre order on audible? Is it because there is a film coming out? The main character , the setting, the humour and unusual plot. Enjoyed all the books in the series so far. She captured the character beautifully. More Flavia de Luce please! Bravo Alan Bradley. These books are both funny and dark with a wonderful heroine. I love Flavia. OK we all know this is not great literature. It's a bit of naughty fun. The problem here is the choice of narrator.The book is written in the first person and seen from the point of view of the likeable, reticent,bookish, oddly naive (for someone with a literatue degree living in the 21st century where knowledge of certain subjects does not require hands on experience) Anastasia . So how much more important it is to choose the correct voice for the narration. The voice here is wrong - too knowing and often too gushing for the character. I'm sure this narrator is very capable when reading the right material but not for this particular character. If you produce another version with a narration more suited to the character I might buy it again (as I'm not sure I'll listen to this version again) and I can't recommend it to others.